We of “Team Married-With-Kids-Under-18” are limited to $2,000 in savings when we income split with our spouse (at least those of us who qualify for the credit since there are other limits as well). Families who don’t have children or have children over 18 get el-zippo, which is just a bit nuts because they’re also FAMILIES. Strangest of all, those on “Team Divorced” have no limits on the income split. People on “Team Divorced” can split their income any which way they like…if the wife earns $80,000/yr and the husband stays at home with the kids and has zero income, they can agree to spousal support payments that would save them THOUSANDS of dollars per year (the savings are of course their savings as a couple….even though they are no longer a couple). So…..sorry I got ahead of myself a bit there….I was just getting over my anger that divorced families who make the exact same money as my family are better off!!! So that seems pretty good right? 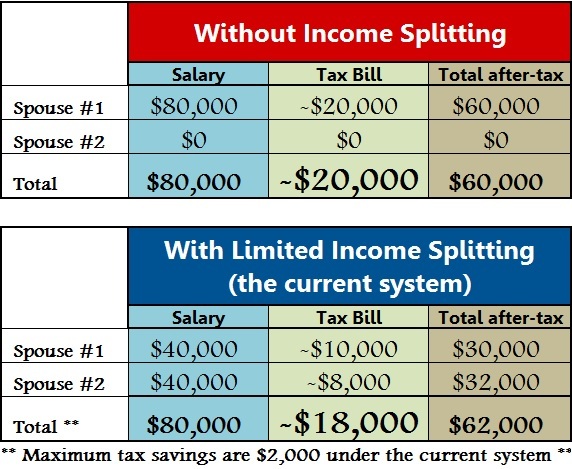 Problem is, in reality (discussed above and seen in the 2nd chart with the blue header) you can only save a maximum of $2,000 from splitting income with your spouse. Therefore, the family above can’t reduce their tax bill to $12,000…..they can only lower it from $20,000 to $18,000! The divorced couple though?….they can reduce their joint tax bill to just $12,000 (chart 3)….I think I’ll send Alanis a tweet, maybe she’ll add a verse to her song. Conservatives: Love it, think it’s a perfect system that benefits everyone and all Canadians should buy them flowers and chocolates and give them massages as a reward for creating perfection. My point is this – while the current income splitting system is a stepping stone to a fair system, it appears to have a long way to go in terms of being anywhere near fair. With the Liberals and NDP wanting to scrap the current program, it makes me think that maybe there are better ways to spend a few billion dollars…. Stay tuned as we let this information sink in…. and I’ll give some thought as to how we can all eventually enjoy the many benefits of divorce….without actually getting divorced. Seeing if this posts somewhere. And now in canada…. a huge benefit to getting divorced with the new liberal CCB. A psedo legal paper divorce will net a family with one high income earner up to $5k/yr/child in Canada Chlld benefit on top of the ability to income split.